Being an artist is one thing, but talking about your work and negotiating with buyers requires public speaking and negotiation skills. Desart’s Raewyn Kavanagh devised a program for Indigenous artists wanting to manage and market their own artwork. 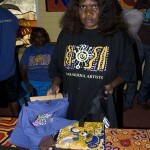 Desart is a membership organisation of Indigenous artists based in Alice Springs. Raewyn co-ordinates the Aboriginal Artworker Program, which supports the training and employment of Aboriginal people working in art centres in the central desert – a vast area covering portions of the Northern Territory, Western Australia and South Australia. It’s a job that often takes her on long dusty drives through the Central Desert region stopping at one remote community after another, to visit the 46 Aboriginal-owned art and craft centres dotted throughout the region. She organises on-site accredited or non-accredited training, mentorships, personal development, job support programs and networking events for over 60 art workers in the Central Desert. 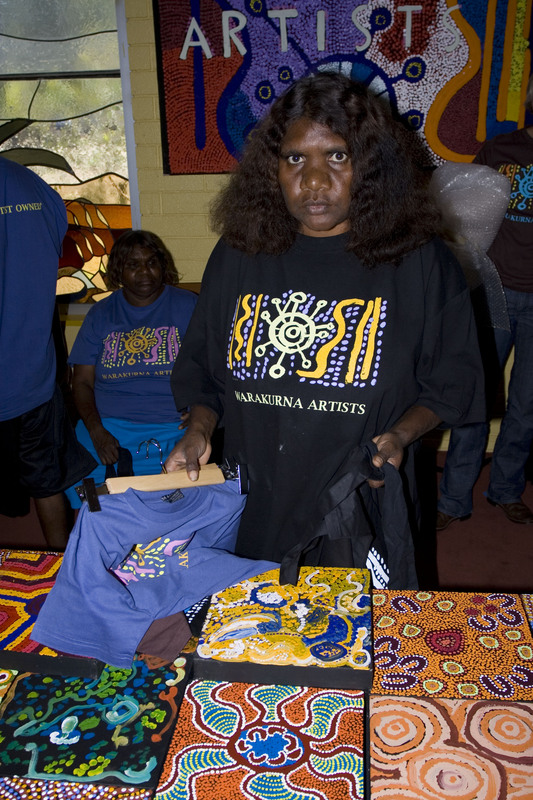 At one of these events – an annual camping conference in 2008 – Indigenous artists from across the region resolved to take over the representation of their own work and not rely on others to do it on their behalf. But taking charge meant learning the skills. Being a skilled artist is one thing, Raewyn says, but talking to customers at markets, galleries and in their own centres and explaining or elaborating on their artwork is another thing altogether. Raewyn devised a unique experiential learning program for Indigenous artists designed to develop skills in public speaking, and she presented the results at the recent joint ALA/ACE Aotearoa conference in Wellington, New Zealand. ‘Marrka Wangka’ – meaning ‘strong talk’ – brought together ten Aboriginal arts workers from all over the central desert region to take part in a five day training program in Melbourne. The arts workers came from Arlpwe Art and Culture, Julalikari Arts, Papunya Tjupi Art Centre, Titjikala Art Centre, Tjarlirli Art, Warakurna Artists, and Warlayirti Artists. And while they all had art in common, they were a diverse group in terms of language, culture and art styles. In Melbourne, the group took part in week of activities including a drama workshop at the Victorian College of the Art’s Wilin Centre, and a visit to the National Gallery of Victoria (NGV). The program culminated with each art worker presenting a visual story of their training to an audience of one hundred people. Raewyn says this was a turning point. After the experience of standing alone on a stage in Melbourne to address one hundred people, talking to individuals or small groups of customers became a much less daunting prospect. As well as being able to talk to visitors to their art centre about their work, the course has had a ripple effect. Some are mentoring others and one participant decided, as a result of the experience, that he wanted to be a teacher and is now working at the community school as assistant teacher. Raewyn says developing partnerships was essential for the success of such a program. Desart secured some funding from the Northern Territory government and gained support from community organisations to help cover costs. The Victorian College of the Arts and Coonara Community House helped to develop and deliver a program tailor made for the learners who would take part.